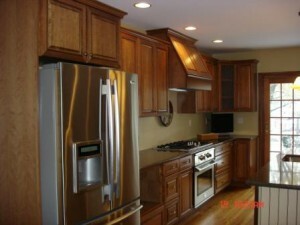 Home // Articles // Replace or Reface Your Kitchen Cabinets? If you’re satisfied with the current layout and usability of your kitchen and are just looking for a change in appearance, you might benefit more from the decision to reface your kitchen cabinets rather than replacing them entirely. If you’re working on a tight budget, it’s probably a better idea to reface your cabinets for now rather than replace them. You’ll still be getting a newer, more modern appearance, you just won’t be changing the layout of your kitchen. Pros will come in to exchange the doors and handles of your cabinets rather than tearing the entire cabinet out and replacing it with something entirely now. The truth of the matter is that brand new cabinets are simply more convenience. They’re built with the modern kitchen in mind, and provide storage options like built-in spice racks and other organizational tools. If you need these additions in your life, it’s probably time to replace your cabinets rather than simply choosing to reface them. These are all issues you should consider when deciding whether you should replace cabinets in your kitchen or simple have them refaced by the professionals. Regardless of which route you take, in the end your kitchen cabinets are sure to lend your kitchen space a new look and feel that you, your family and your friends can appreciate when gathered in the heart of your home.